Every 6 months, the French Team holds release parties. For Ubuntu 8.10, a release party was held in Paris with 12 install parties throughout France. Th release party, organized by ubuntu-party and the French loco team, ubuntu-fr, took place at the “Cité des sciences et de l’industrie” in Paris, 29-30 November 2008. 4000 people attended the event, which broke the record from last year, almost 3000 visitors! But an Ubuntu Party is not only a party where geeks come, eat, drink beer and socialize. An Ubuntu Party consists of various activities, for all knowledge levels. 14 hours of conferences on various subjects. Some basic, aimed at answering “What is Ubuntu?”, “How to Contribute to Ubuntu?” and “What is the French Community ubuntu-fr?” Others on more universal issues like accessibility, computer science and freedom, art and free culture, and open formats. Videos will be available online soon. 8 hours of initiation training: beginners (learn how to use ubuntu in a daily basis) and more advanced session (introduction to command line usage). Approximately 200 attendees have been able to practice on those two subjects. Hundreds of machines where Ubuntu was installed by lots of volunteers. More complicated cases were handled by the Parisian LUG: Parinux. April, a non governmental organization, and Mozilla European Foundation were also invited. They organized some conferences and activities which attracted and motivated the audience. 10 demonstration computers, with some team members around to help guests to go through and discover Ubuntu’s interface. A bug jam where 10 people learned how to triage bugs. Some programming and packaging courses have been also provided to people who wanted to get involved in FOSS development and contribution. More than 20 hours of radio broadcasts thanks to oxyradio, a French webradio broadcasting only free music. They interviewed the organizers, enabling those who could not go to Paris to interact with the party. Ubuntu-fr provided 3000 CDs. The CDs were localized. 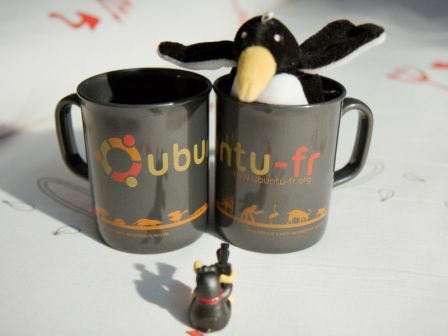 Ubuntu-fr sold also tee-shirts and new awesome mugs! 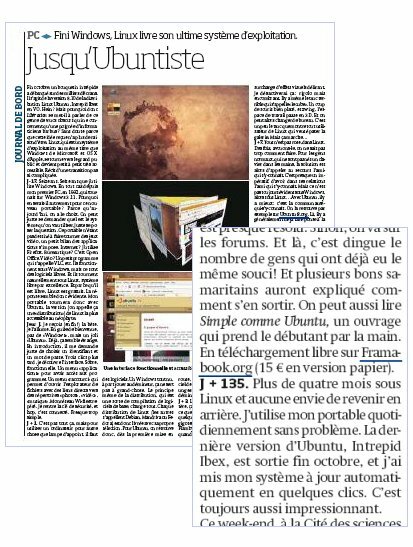 Thanks to our press contacts, we had a full page dealing with Ubuntu in a French national newspaper called “Libération” (circulateion: 140 000 per day). After the party, the national French press agency published a story about the party. More photos available here. They are all CC:by licence. Thanks to Kagou, Mauriz, Rock_n_pol, Darksiegfried and Luc Byhet! Great events, incredible volunteers, a large audience discovering Ubuntu and free software! The road is open for organizing the Jaunty Ubuntu party! Hope to see you, with more and more people on the next turn, in May 2009! Adapted from Didier Roche’s post.